Growing up in the 1980’s, I was a HUGE fan of the Spot ‘lift the flap’ books and watching the animated version on TV. Written by Eric Hill over 35 years ago, Spot has become a firm family favourite all over the world. The books have been published in over 50 languages and are now also available in sign language and Braille editions. His toddler-like behaviour, getting up to mischief and exploring the world around him resonated with children and parents alike, making him the superstar pup he is today. I vividly remember sitting with my Nan at her house and her reading the book, “Where’s Spot?” to me as I sipped a cup of warm Ribena and chomped on a packet of Quavers (we only ever got a treat like Quaver’s at my Nan’s house…). In fact, when I think of Spot, more often than not, I think of my Mum and my Nan. Precious memories. Teaching children how to handle books is a very important life skill in my opinion. To be careful with the pages, to treat the book gently, to learn the fine motor skills required to turn the delicate pages over without tearing them. A life the flap book is another, fun way of teaching the children how to do this. When I was offered an opportunity to review a re-release of a Spot ‘lift the flap book’, I jumped at the chance. We don’t actually have any Spot books (all my childhood ones are lost somewhere in the abyss of my parents loft) so I took this as a wonderful opportunity to pass my childhood love of these books on to my youngest boy, Ben. He’s 2.5 and the perfect age to enjoy a Spot story. The book we were sent was, Spot goes on Holiday. Again, this is a book I remember well from my childhood and it’s delivery was timely as were were due to go off to Wales on a Camping holiday that same week. Perfect! It would help explain to Ben what we were going to do and what he might see on our trip to the Welsh seaside. Every night that week, me and Ben sat down together at bedtime and read the book. He loved it as much as I recall loving it. We also ended up taking the book with us camping as a bedtime read because he loved it so much and he even recognised some of the pictures in the book from our own days out. He turned the pages carefully, he was excited to see what was hiding under the flaps on each page and was actively seeking out the part on the page where the flap might be after just a couple of pages. He was repeating the names of things back to me as I said them and he also began pointing at Spot and saying his name on each page when he found him. It was just adorable. The story lines are simple, the characters are lovable, the illustrations are really colourful and child-friendly and there is a kindness about the books that I can’t quite explain but I know is there. Like seeing a friendly face, someone familiar, someone you know. I cannot recommend the Spot books enough if you have a little one. I would hazard a guess and say any child up to the age of 5 or so would love these books, and then, even once they are 6 or so and reading for themselves, I am sure they will still enjoy it to a certain extent. My middle one did, because the books are fairly simple language with bold print, he was more than capable of reading it to his little brother by himself. He then prompted his little brother to lift the flaps, to seek out the characters in the pages and loved sharing the story with him and was really proud of himself afterwards for being able to do that on his own. Spot has had a bit of a rejuvenation online too and now has his own website! You can find the link to the new website here. 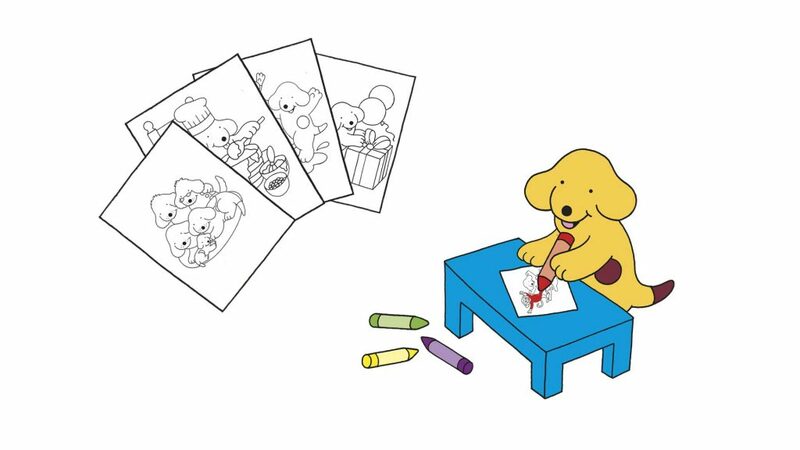 Once on there, you are able to download and print off some Spot colouring sheets, play a dressing up Spot game and find out more about the world’s most lovable puppy! My middle one loved playing the online game and we took some of the colouring sheets away camping with us. If you are local to Cheltenham, UK, there is a Spot event being held at the Cheltenham festival in October 2016. Details can be found here. If you would like to get your hands on your own Spot ‘Lift the Flap’ book, just enter my competition! All you need to do is enter this Rafflecopter! Competition closes Friday 19th August. Winner will be announced on Saturday 20th August on my Facebook page so do swing by to check out if it was you who won! I will then be in contact to organise sending the prize to you. Spot says good luck! Woof! Do follow me over on Facebook to see if you’ve won! Spot has his own website? How times have changed! My little grandson would love this book. That’s a lovely review, and it brings back memories of my own children reading the Spot books. Laura – dear bear and beany recently posted…Style Challenge with George at Asda…#Mini Me! Ah. He’s been around a while has old spot hasn’t he! Thanks so much for entering Keri, good luck!! Thanks so much for entering Laura!!! Aw, my daughter loves #Spot. Oh bless you Heather! How sweet! Thanks for entering and the very best of luck to you! I couldn’t agree more David! Thanks for entering!